The Simi Transfer Sheet is an edible paper that is used in the Sugar Art and Pastry world. Simply use an edible printer to print a desired design and place behind isomalt. These sheets have provided a beautiful solution for the Isomalt world. Online edible image printer and ink supply store, Icing Images has announced Simi Transfer Sheets, a completely new edible paper that is used in the Sugar Art and Pastry world. Simply use an edible printer to print a desired design and place behind hot Isomalt. Unlike icing sheets, sugar sheets, frosting sheets, wafer paper, or cocoa transfer sheets, the Simi Transfer Sheet is an edible sheet that is used to apply a semi-transparent design on to Isomalt. Named after Simi Cakes and Confections, the initial Transfer Sheet was originally intended for chocolate but designed without the fats found in traditional chocolate transfer sheets. After failing to adhere to chocolate as expected, Edible Artist Sidney Galpern began to experiment with Isomalt and created the techniques for using Simi Transfer Sheets. These sheets have provided a beautiful solution for the Isomalt world. Unlike a regular icing sheet, the Simi Transfer Sheets (part of the Icing Images Edible Paper line) leaves only the ink on the Isomalt, whereas when using a printed icing sheet the entire icing sheet remains on the Isomalt or cake, adding an additional layer. Due to the transparent nature of the Simi Transfer Sheets, the area remains clear after applied; leaving just the ink behind gives the printed pattern a transparent pattern that is magnified, creating a vibrant and stunning edible design. Other techniques are being made available and will be announced over the next few months expanding the use of Simi Transfer Sheets. Use Simi Transfer Sheets with iDesigns™, an edible printing program that provides customers with over 1600 different images that are created for the edible art world. Icing Images offers this fine product in two ways. Users without an edible printer can upload or create their own image, and Icing Images will print and ship the image in the contiguous United States. Users with an edible printer can order a pack of 25 blank transfer sheets for only $30 at Icing Images, Simi Cakes, or Pfeil & Holing. Simi Cakes and Confections has been in business for almost 10 years and has been producing quality Isomalt for the edible art community for over 5 years. As an innovative leader in the Isomalt industry, President Sidney Galpern has pioneered the isomalt industry as well as been a judge, instructor, and introduced many new products and techniques for the edible art industry. Simi Cakes also develops designer silicon molds, and innovative cake decorating tools for retail bakeries, pastry chefs, chocolatiers, cake artists, and even home hobbyist. For more information visit http://www.simicakes.com. 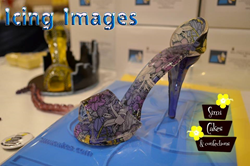 For over 15 years, Icing Images has been a leader in edible photo and edible paper art supplies. An innovative leader, owner Deborah Coughlin was presented with the prestigious Sweet Life Hall of Fame Award in 2015. Offering edible ink printers, vibrant edible inks, flexible icing sheets as well as electronic and manual food safe die cutting systems as well as Premium flavored and colored wafer paper and DECOGEL™ to retail bakeries, home bakers and cake decorators. Learn more by visiting http://www.IcingImages.com.